Why affordable antique Victorian washstands and dressers make prime choices for bathroom vanities. 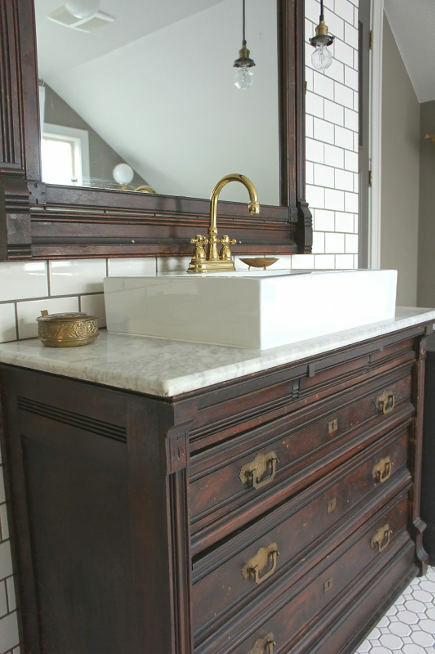 We’ve seen attractive bathrooms where wooden dressers, tables and cupboards were made over into sink vanities. Usually these are designer powder rooms where expensive antique chests or tables were modified. Any piece of furniture altered for use in a bathroom must be sturdy enough to withstand daily wear and tear, as well as dampness. An Eastlake dresser bathroom vanity, complete with matching mirror, made a handsome addition to renovated attic master bath in Portland, Oregon. The reno was done as a flip by a company called Chic Design Investments, which showed photos of the project with just a few notes. But converting the three-drawer dresser into a bathroom vanity isn’t a secret process. 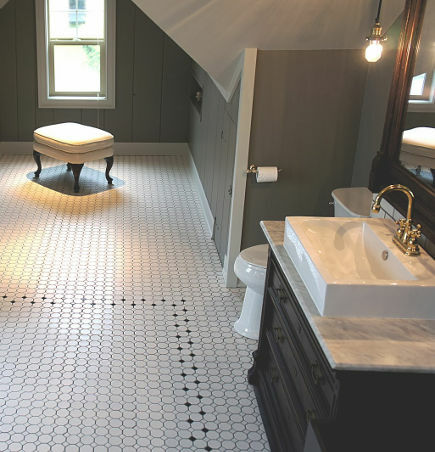 First, it’s necessary to decide whether the top two drawers will be shortened to accommodate the sink drain, or whether the drawers are converted to a false front. It’s likely the third drawer would be usable. The top of the dresser, and the marble, need to be drilled to allow the faucet stem to come through. The dresser could originally have been a washstand with an attached mirror (to protect the wall), like the one I found in a recent auction listing with a $300 estimate. 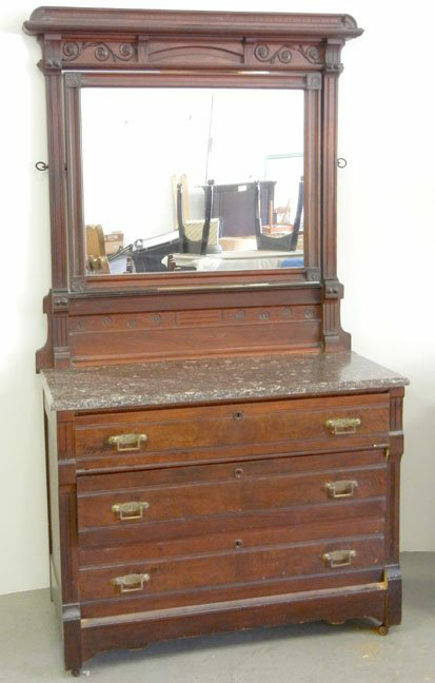 Or, it could have simply been a dresser with an original marble top and matching mirror. A vessel sink, which appears to be Duravit’s Vero — was then set on top and caulked to seal it to the marble. Duravit’s Vero has an integral deck in back where the faucet can be placed. While that makes the sink bowl slightly smaller, it also may eliminate some splashing. 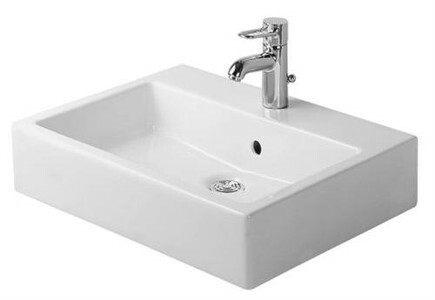 Very often, wall mounted faucets are used with vessel sinks. While the choice of a brass sink faucet is a nice match for the brass dresser drawer hardware, this faucet is unfortunately small and a bit off scale for the vanity. Charles Eastlake was an influential English writer and designer who espoused simplicity and “solid wood.” Dressers and washstands associated with his name and the Japanese-influenced Aesthetic movement furniture of the late 19th and early 20th century, were exceptionally durable. 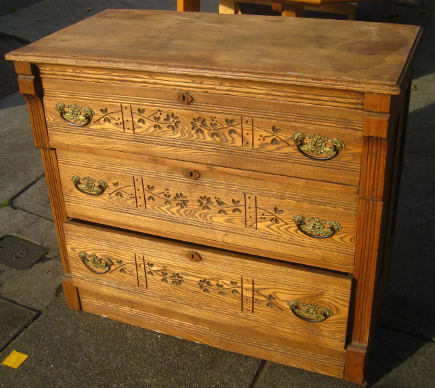 Many have leaf motifs on the drawers and elegantly incised brass fittings. Aside from some of the outlandishly priced and overly restored listings on eBay, an Eastlake dresser bathroom vanity is still affordable. The restored oak dresser (above) sold for $100. In 1872, Eastlake’s “Hints on Household Taste in Furniture, Upholstery, and Other Details,” was published in the U.S. It is available to read online but the commentary is cranky. Still, one passage caught my eye: “The natural grain of such woods as oak, rosewood, walnut etc., is in itself an ornamental feature, if it be not obscured and clogged by artificial varnish.” Both the mirror and dresser in the Portland bathroom retain their original matte stain and finish and the patina they developed with age has been respected. If there was ever any varnish, it’s long gone. I think Mr. Eastlake might approve.